Do you know if you have high blood pressure? What if we told you the numbers that define it have changed? Well, they did change the numbers, but don’t worry—we’ve broken it all down for you so you can keep an eye on your heart by arming yourself with the latest information. For the first time in over 14 years, the American College of Cardiology (ACC) and the American Heart Association (AHA) recently changed their guidelines to help detect, prevent, manage and treat high blood pressure. We have aligned our app to match these new standards, and you may notice some changes from what you know about blood pressure numbers. 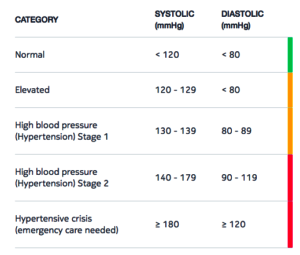 The new guidelines stress the importance of using proper techniques to measure blood pressure, and they also recommend “the use of home blood pressure monitoring using validated devices.” They also want to train professionals to detect “white coat hypertension”—a syndrome that can be avoided when measuring your own BP. The new guidelines were enacted, in part, to increase hypertension awareness and to nudge people towards healthy habits. Being aware of your blood pressure can encourage lifestyle modifications—such as proper diet and exercise—that have been proven to help people manage heart health. These guidelines can help you understand your readings and help you make better choices. They should never replace your doctor’s expert opinion. But if you want to keep tabs on your health, we can’t help but mention that with the Withings blood pressure monitor and the Health Mate app (for iOS and Android), you can share your results with your doctor via email in just a few taps. We hope the new info is helpful, and the good news is that blood pressure can often be managed or controlled with proper monitoring a few healthy lifestyle changes. For more info, check out this data story on how weight loss lowers blood pressure, and another about how as little as 1,000 extra steps a day can lower blood pressure. Blood pressure monitoring made simple.